Sometimes, good things come in small packages. In this case, in the form of a 1/2 pint amber flask. You know the feeling; you look at a bottle that you've never encountered before, pick it up, and it "talks to you". Kind of like a stray pup or a kitten. It says "I'm something special. I know, you've never seen me, or even heard of me before, but trust me, don't put me down". It spoke, and I listened. I recently had an amber flask in my "revolving collection" that looked virtually identical, sans the embossing. It was an embossed recessed slug plate defender flask from down on the southern California coast. It was a cute little guy. One that I'd had in clear for years, but never seen in amber. Main difference between it and my new one was that it had the town listed on it. I don't normally go out on a limb for a complete unknown but this new stray had spoken to me and without thinking twice, I acquired it. It was a five hour trip back south, so I had plenty of time to kick ideas around as I motored along at 55 miles an hour, towing my new 5,000 pound home away from home. We pulled in late last evening, and I flopped myself down in front of the computer to answer a mountain of emails and maybe, spend a little time trying to learn a little bit about my "new friend". I figured the easiest way to ID this flask was just to plug in the address, and then start chasing down the location. Once I had that, the who's who would just drop in my lap. A piece of cake, or so I thought. The bottle was in with a bunch of stuff from Portland, so Oregon or Washington seemed to be the natural place to start the search. Wow, talk about a dead end. Seattle, nope. Same thing with Spokane, and other larger Washington state cities. Portland, Salem, Albany, Eugene, and then eastward to the Dalles in Oregon. Nope! Not a single one had the right combination of 1st Street, West, and 215 tossed in to cinch the deal. Midnight came and went, and I tossed in the towel for the night. The sun blazes thorough the east window of our bedroom in the second story turret at a little after six AM these days. Up and at 'em early, after coffee and bacon, I went at it with a renewed vigor. But with a different angle. I figured that the flask must have originated in California instead of the NW. Slowly but surely, I made my way past one large city after another. I refused to give up. There just "had to be a be a pony in the closet"! About 700 miles south of the Oregon border, and countless large cities later, stubbornness was rewarded with SUCCESS! Los Angeles California. Duh... 20 scant miles from Redondo Beach, is 215 West First Street in the old original downtown section of L.A. 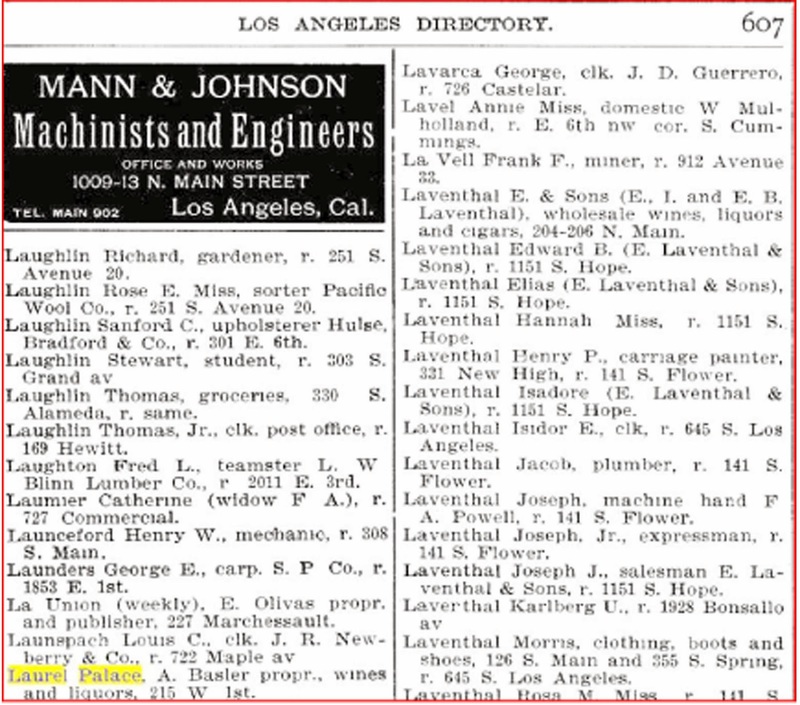 The first mention I could find of the saloon was located in the 1894 edition of the LA City Directory. Location identified, I went to work on the identity of the owner. 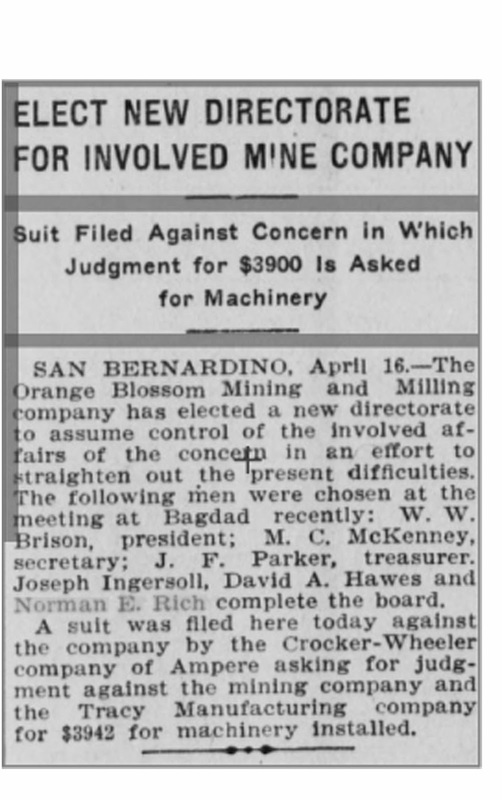 It was owned by two partners by the name of McGinnis & Basler. The order of the names suggest that McGinnis was in the drivers seat. 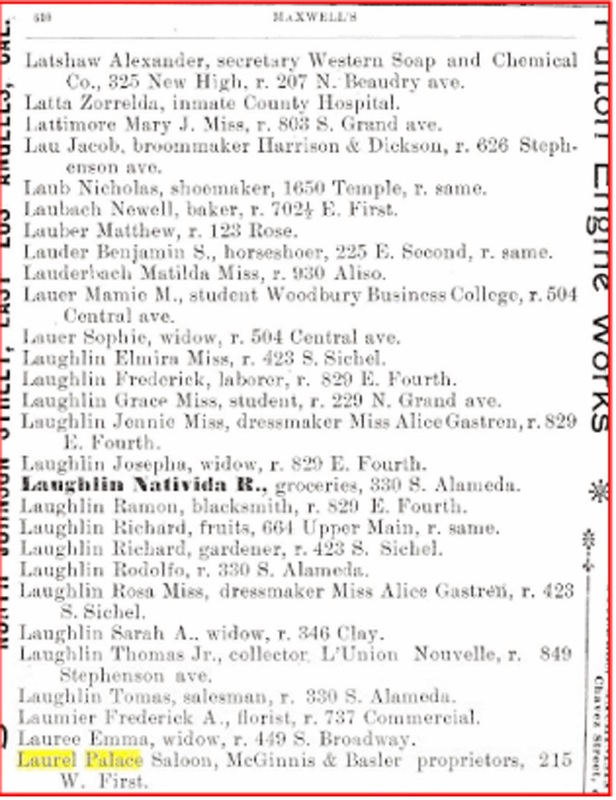 The 1898 directory lists only Basler, "A. Basler, Proprietor". 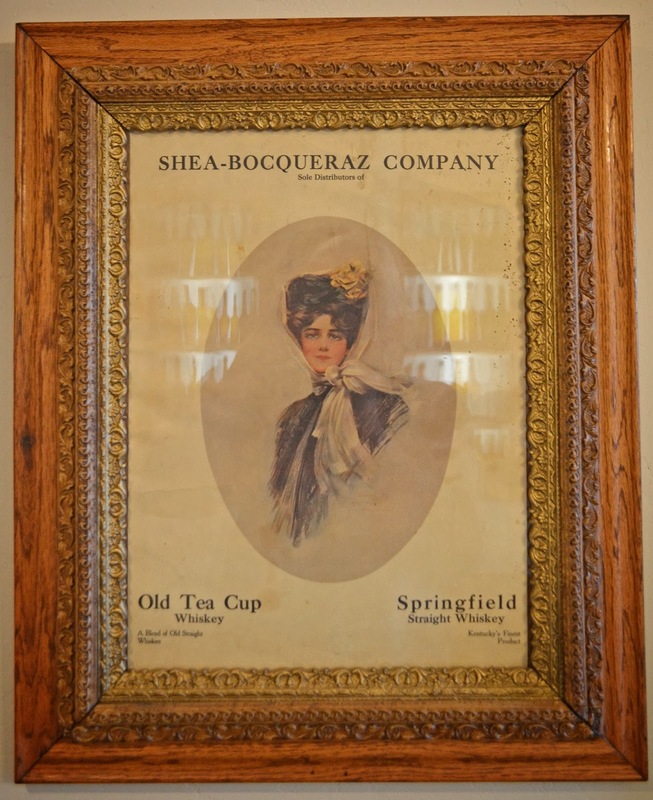 It also is missing reference to "Saloon", and instead shows it as "Wines and Liquors". Did Basler decide to retail instead of tend bar? The September 1, 1900 edition of the Los Angeles Herald had an interesting tidbit of news. 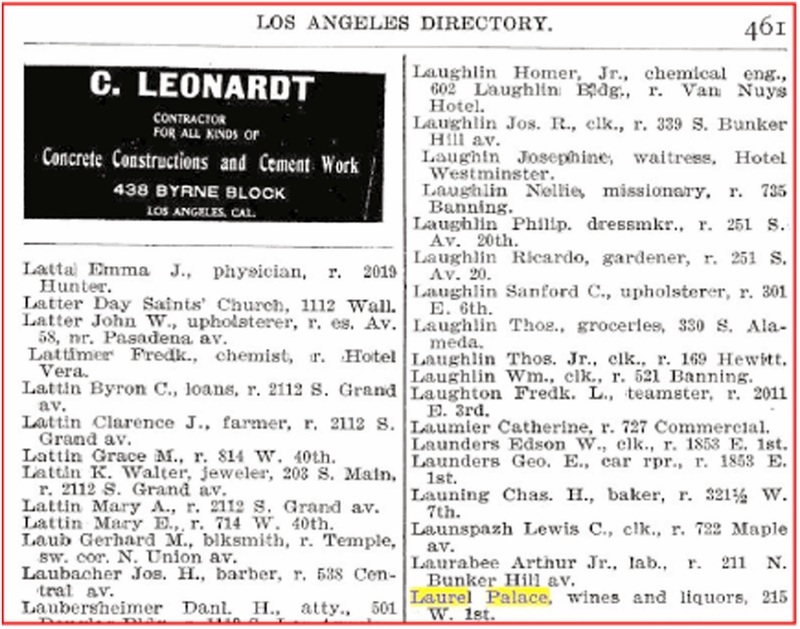 The 1901 directory lists the presence of the Laurel Palace (sans Saloon), in the same location, but without any reference to ownership. Finally, in 1911, Norman E. Rich, makes his official debut. 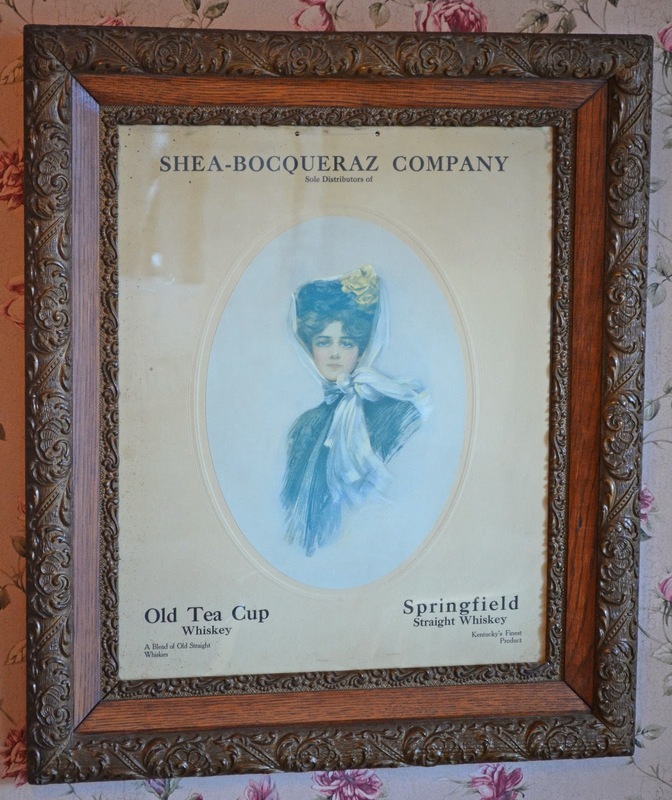 And "Saloon" is prominently present in the title once again. 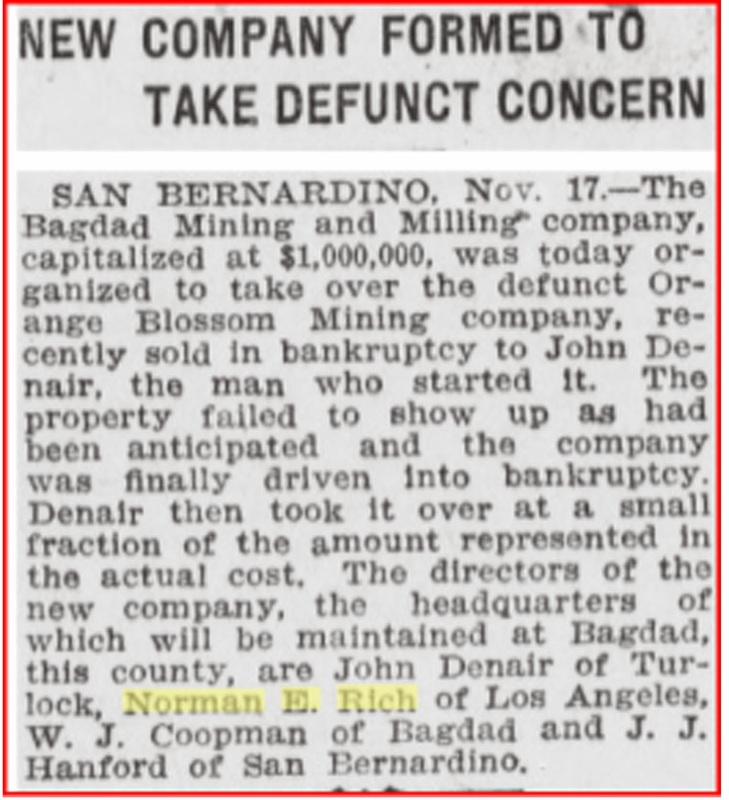 Norman Rich had his irons in other fires as well; specifically gold mining. The last reference that I could find in the directories to the Laurel Palace and or Norman E. Rich was the 1915 edition. 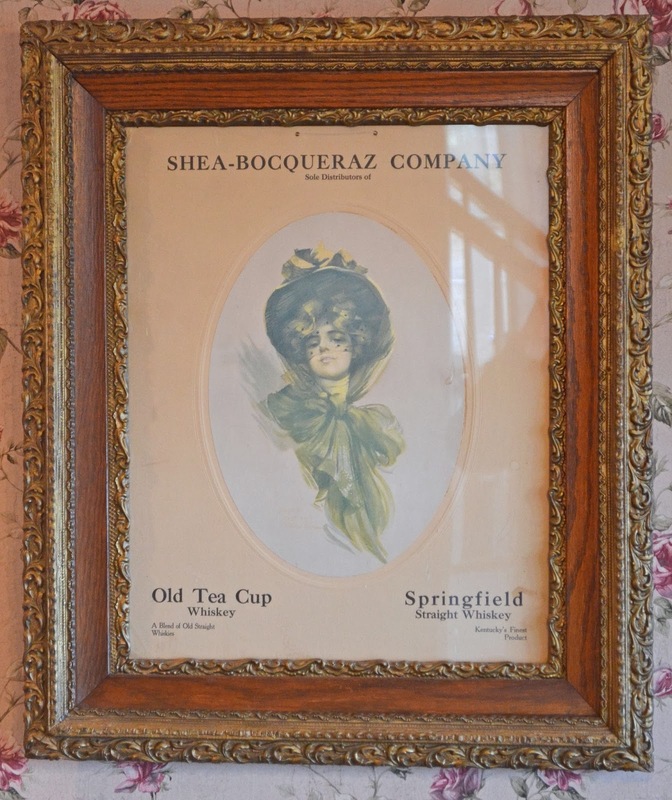 The type is identical to that which appeared in 1911. After that, both the Laurel Palace saloon and Norman E. Rich disappear into the pages of history. 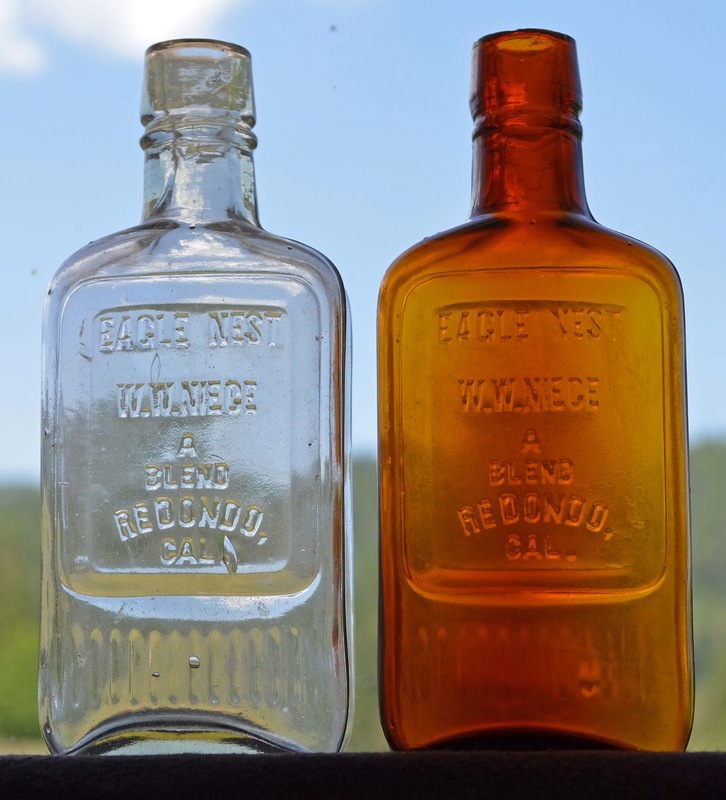 Fortunately, he left us with a lasting reminder of his brief foray into the saloon business in the form of a little amber flask that I dare to say is just as elusive as it's older and bigger brother from San Francisco. "We see this hairy arm reaching out the window. I say what the hell, he gonna get cut that dude with the broken glass, man. Then a whole body coming out the window, looked like a monkey, only big damn monkey with a stick on the hand. Maybe about 7-ft tall. It had short, reddish hair. But hold on, the face was human looking, as crazy as it sounds. My wife kept telling me to drive away, so we did. I got to see the animal’s eyes and all, big and dark, with a huge head, like a triangle shape, kinda, know what I mean?" OK, so if Sasquatch is being spotted in Detroit, how come there's no Theo Blauth sneaking around Sacramento? I mean folks claim to have seen him, why, there's even photos and movies "proving" that he's real. The other day, old pal Steve Abbott and I were tossing around the subject of lost western whiskies. 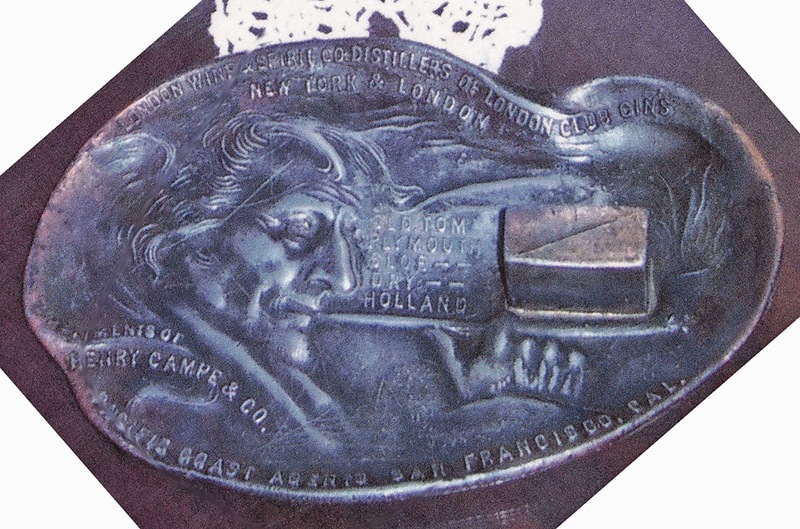 You know, the ones where only pieces have been found, and then even the pieces have disappeared; like the Sutro Nevada - Old SIgnet find (don't get me goin' !). And then there's the "only the good die young" bottles like the "Palmtag & Barnhart slug plate Phoenix Bourbon" from Hollister. It made it's appearance in the early 1980's, set the western collecting world on it's ear, only to pull a humpty dumpty and end up in a pile of pieces. 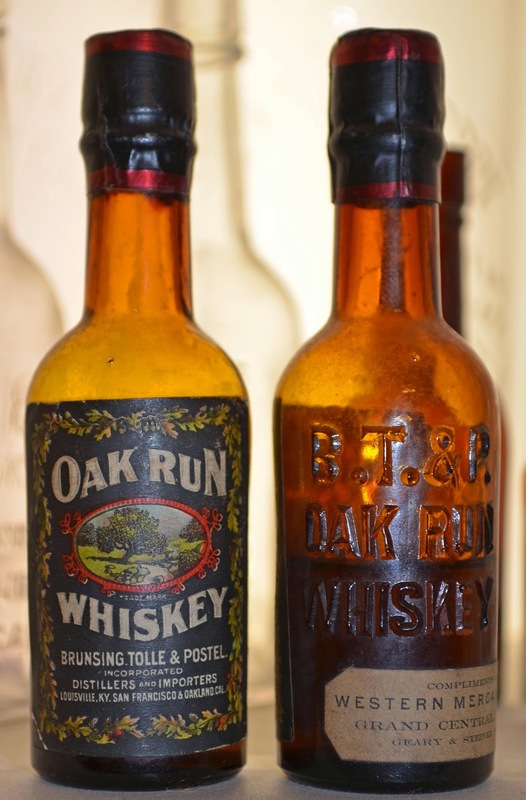 None have been seen since~ Back in the late 1960's I dug the first known example of the Hotaling OPS Bourbon (without the "OLD" in between Hotalings and Private Stock) in a mountain of oyster shells (spelled the consistency of concrete) in a saloon dump in the hills above Saratoga, Ca.. My OPS also pulled a humpty dumpty, flying off the bottle shelf in the living room. The score - flagstone hearth 1 - OPS 0... Fortunately, a few have surfaced since then, so it doesn't qualify for Sasquatch status. All the above were glop tops so the lack of new finds is understandable, given both the age and the lack of numbers actually blown to begin with. It's #55 in Western Whiskey Bottles 4th edition. Now we know this isn't just an "old figment" of our imaginations because we've seen a photo of it. It's on page 37 #2 of Bill Wilsons "Spirits Bottles of the Old West". He rated it as common, with a scarcity rating of *10 in amber and *6 in clear. 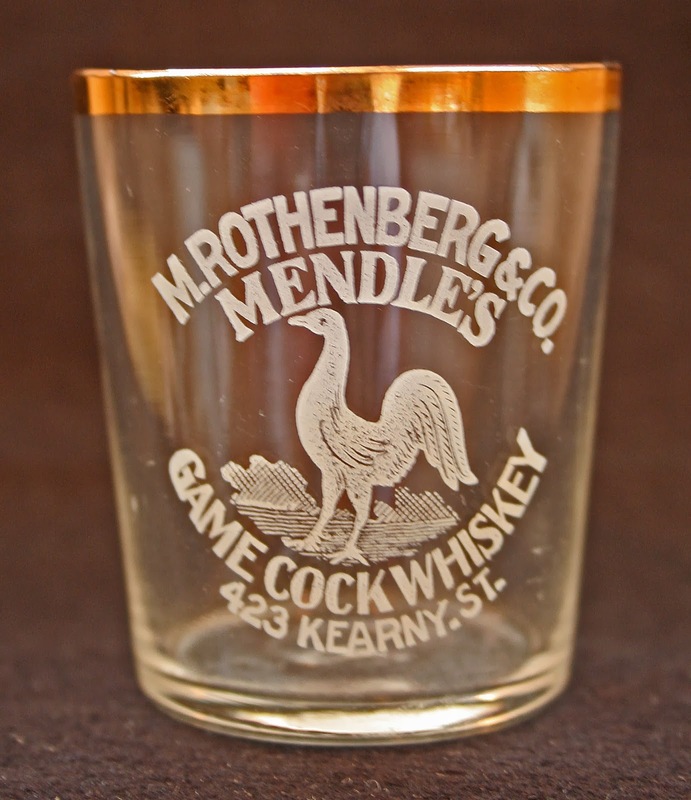 We know that he sold MELLWOOD WHISKEY based on a small advertisement that exists (the only advertisement...). 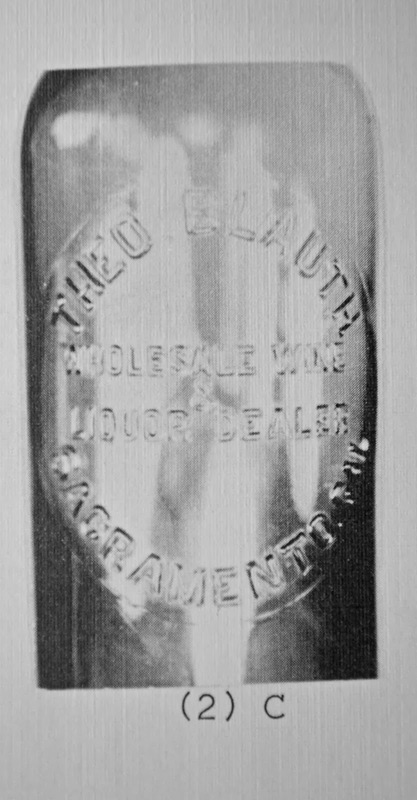 The actual brand name was owned by Mellwood Distillery of Louisville, KY. As such, Blauth was just a licensed west coast wholesaler of the brand, along with Theo Gier of S.F. 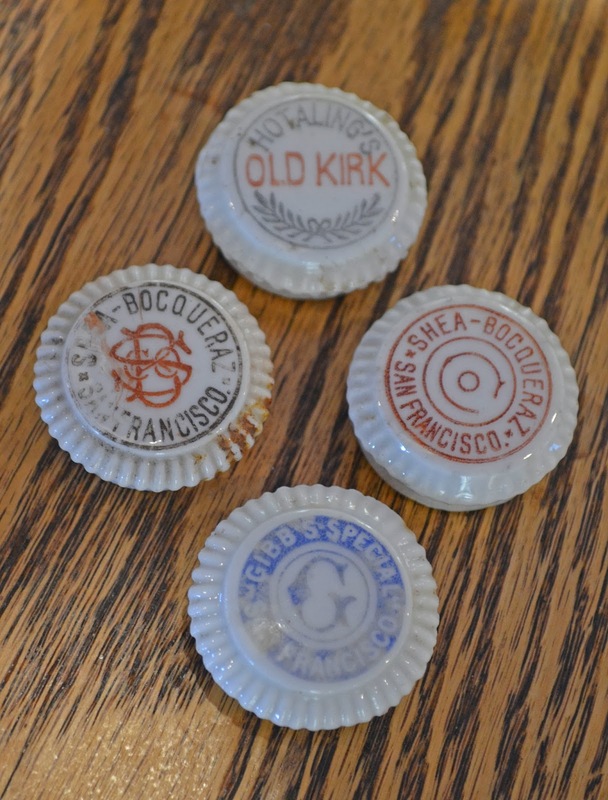 He also owned California Bottling Works, dba T. Blauth or T.Blauth and Sons, which produced lots of embossed beer bottles. "This piece of info is amazing. My wife and I were on an Alaska cruise. We stopped in Ketchican for a few hours. I went on a long and rapid walk as far through town as time would permit. 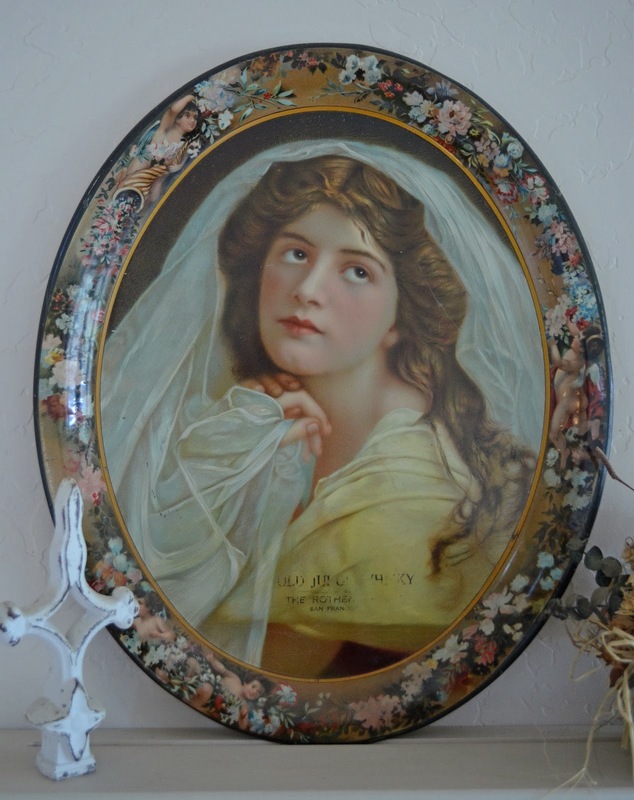 I saw an "antique"/thrift store. It had a Buffalo Beer opener. I bought it and asked the owner how she got it. She said she bought the shop and inventory from a person from California. We talked about that, then she said she had the business ledger from the other party with all the inventory. She showed it to me. On the inside page in florid script was THEOBALD BLAUTH. She wouldn't sell me the page. She said that apparently the previous owner was a descendant of Blauth and that she had a couple of beer bottles at home. She told me the man's name and that he lived in X----YZ California." When I got home, I started searching and actually found the man based on the info that she'd supplied me with. "He said that I should talk to his mother who was 90+ who lived in XXXXXXXX, and gave me her phone number. I called her and talked to her for a half hour or so. Great memory. Blauth was her grandfather, but died before she was old enough to know him. I kept notes on the conversation and placed them in a loose leaf notebook titled "WHISKEY MISCELLANEOUS." I have never seen a Blauth billhead or anything else, though for a guy who sold as much beer and whiskey as he did, there must be some." 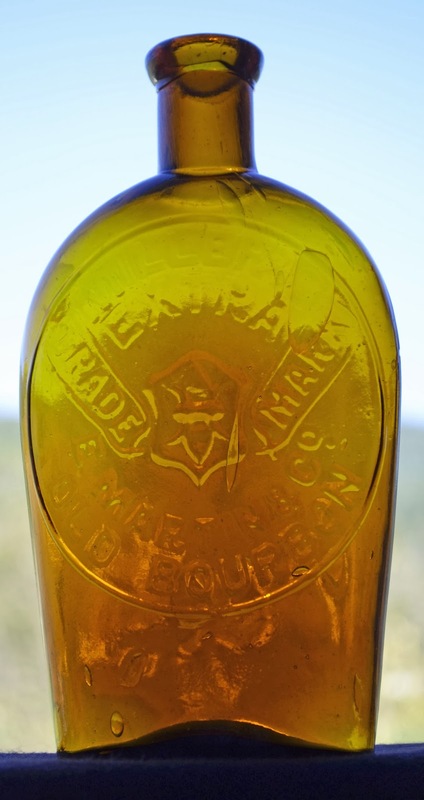 Mr. Blauth engaged in the wholesale liquor business in 1880, and lived to see the 28th of February, 1918, and to acquire considerable property, which he left in his estate. His good wife also died here. associated himself with his father, in business. But in terms of the business, talk about a dead end... This outfit just flat kept a low, low, profile. 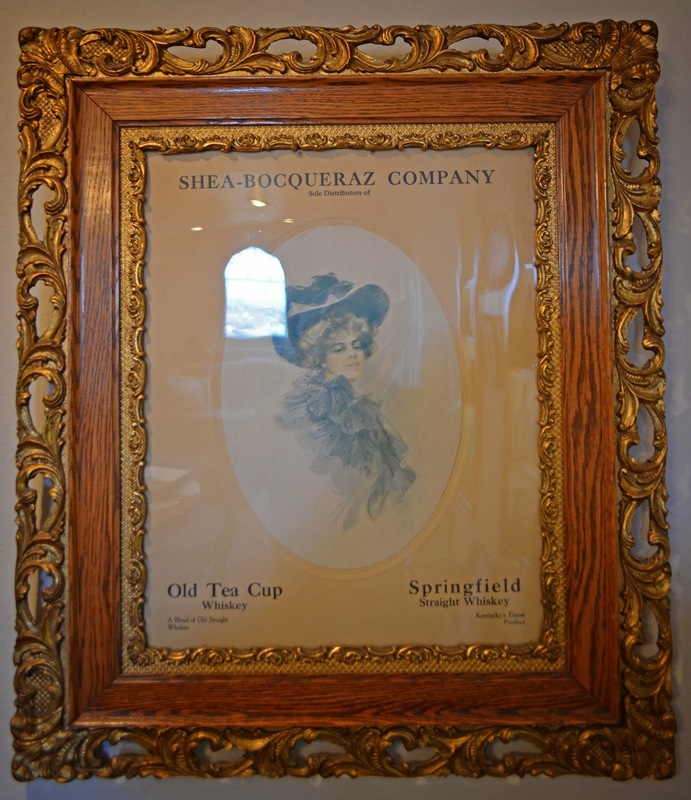 Nothing in the way of liquor advertising, no shot glasses, no back bar decanters, no back bar signs; just plain nuthin'. 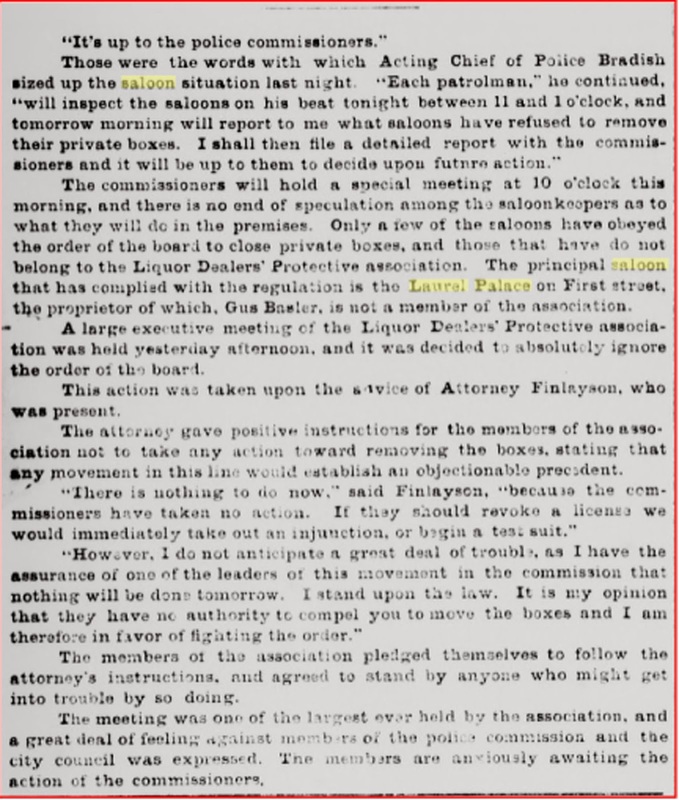 WOODLAND (Yolo Co.), September 19 - C. BLAUTH, a Sacramento wholesale liquor dealer, who was arrested at the instance of District Attorney HUSTON for selling liquor in Washington without a county license, pleaded guilty to the charge before Justice LAMPTON yesterday. 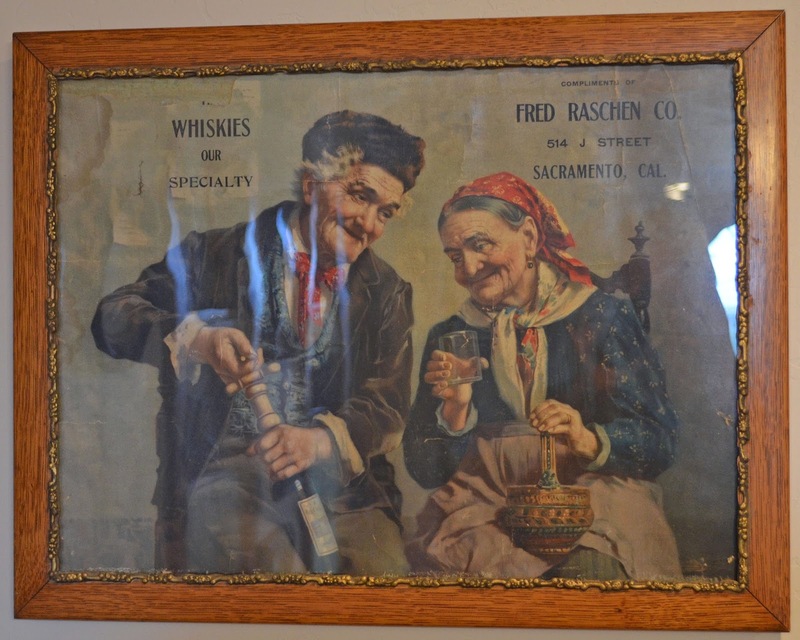 It seems that Blauth has been in the habit of retailing liquors from a wagon sent over into Yolo County. He said that he was ignorant of the fact that he was violating an ordinance, and promised it would not occur again. Upon this understanding sentence was withheld and he was allowed to go. cylinder seems to have vanished under the radar, since we can't account for any intact examples that are present in a west coast collection. C'mon now, there's got to be some out there! 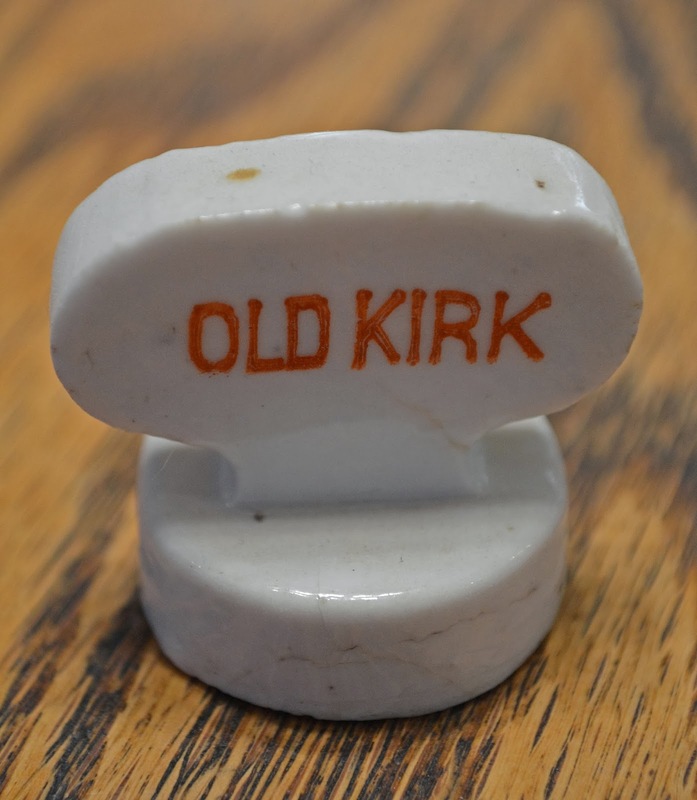 They're late, pretty plain, and were rated common back in the late 1960's. 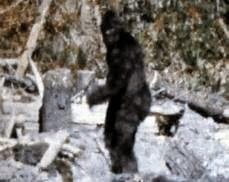 Send me a current photo or two of it, just to prove that it's not a Sasquatch! A friend emailed today, asking if I'd noticed what was up with Sole Agents site today. I hadn't tried to log in since earlier this week. This is what greeted me as the home page. Bummer, and a real loss for the west coast fraternity. I touched base with Sole Agent a couple of weeks ago about migrating the archived articles to this website if his folded. At that time, he had intentions of simply renewing the domain. Now that a domain shark has possesion of it, we'll try to figure a way to have his old database added to this one. If any of you computer experts have an idea about how to implement this, please get ahold of me and we'll give your plan a try. Every so often, this topic comes around. It's like a bad habit that just won't go away. 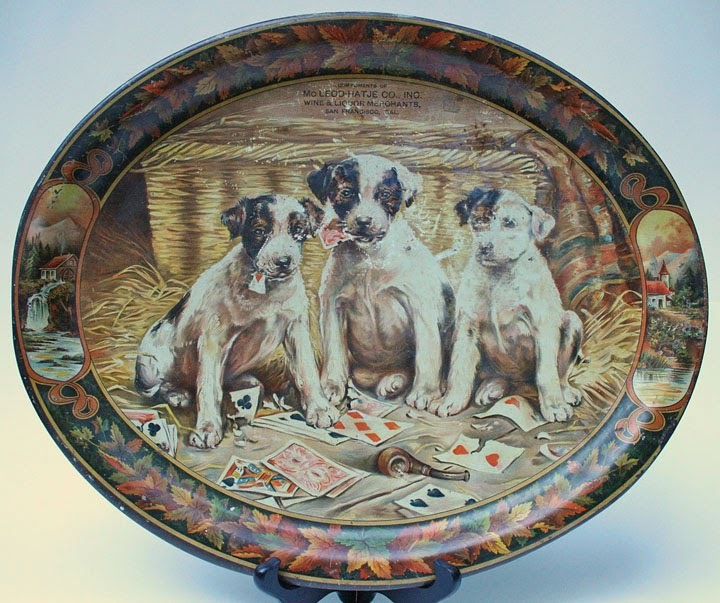 Recently, an online glass gallery auction closed. 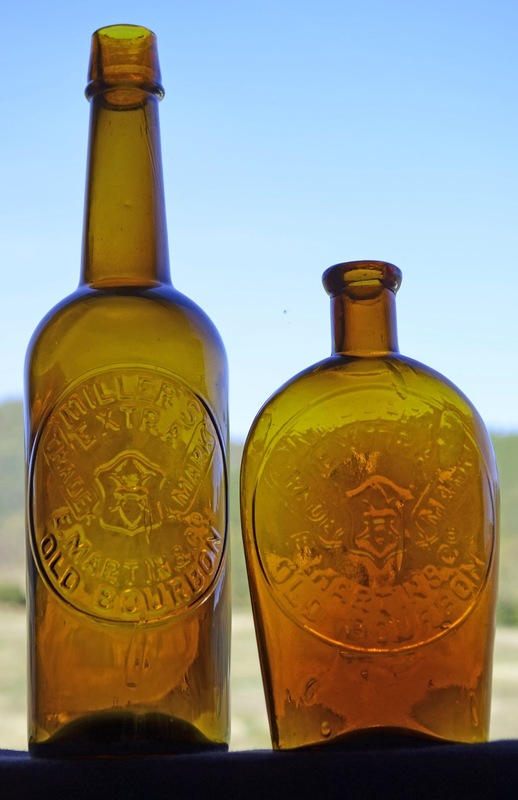 A collector won the high bid on a bottle that measures 8" tall by 2 3/4" wide at the base. It weighs 11 ounces. The hammer price was $70~. The bidder received their invoice via email. The invoice was in the amount of $100.60. The amount was for the price of the bottle, shipping, plus an 18% buyers fee (reduced to 15% if paid by cash or check - this fee was understood and acknowledged prior to placing a bid). "8. Shipping: Shipping, insurance and packaging charges will be added to your bill unless the lots are picked up in person. With the exception of larger items we ship U.S. Mail, registered, 1st Class and insured. Larger items will be shipped via U.P.S. or by freight. When shipping by freight, shipping and packing charges will be billed C.O.D." The shipping charge on the invoice was $18.oo. Yes, Eighteen Dollars. The buyer took exception to this. A check of the USPS rate calculator showed the actual cost of mailing from the east coast to the west coast as $9.97 via USPS Priority 2 day. Let's summarize; $9.97 actual cost vs. an invoiced amount of $18.00. 1) What would your thoughts be if you got this bill? 2) Is this reasonable or A Rip-off?